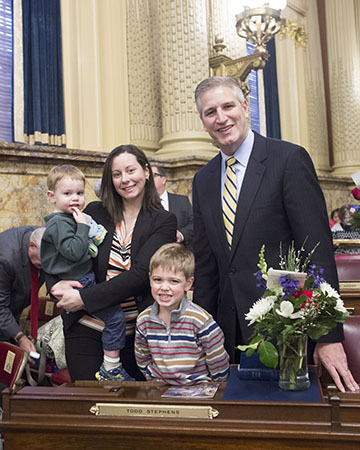 HARRISBURG -- Rep. Todd Stephens (R-Montgomery) took the oath of office today to begin his fourth term representing the people of the 151st District in the Pennsylvania House of Representatives. In previous terms, Stephens, a former prosecutor, has authored laws protecting children and victims of domestic violence as well as measures to reduce gun violence and to protect animals from abuse. Last session, he headed the House’s investigation into former Attorney General Kathleen Kane’s misconduct leading to legislative recommendations to prevent such situations from occurring in the future. He will be introducing legislation to implement many of those reforms along with other measures to protect taxpayers and our most vulnerable citizens this session. Stephens is also on the forefront of the fight for clean water and holding the federal government responsible for all costs associated with removing perfluorinated chemicals (PFC) from local water supplies. The PFCs entered the water systems due to firefighting training activities at the former Willow Grove Naval Air Station – Joint Reserve Base in Horsham Township. “I will continue fighting for the people of the 151st legislative district and look forward to taking on the pressing issues before us,” Stephens said.